For anyone whose bucket list might include a photo safari to some exot- ic place, but time, expense or travel have kept it from coming to fruition, a trip to The Wilds could be the next best thing. For the cost of a tank of gas and a day’s drive from most anywhere, this center for critically endangered wildlife is a hidden treasure. The remoteness of North America’s largest conservation facility makes it easy to forget it’s just 90 miles east of Columbus, Ohio’s state capital. Although a science-based conservation complex was first conceived in the 1970s, it wasn’t until 1984, when the Central Ohio Coal Company donated nearly 10,000 acres of reclaimed surface-mined land to the project, that the concept became a reality. It required great vision, for essentially there was nothing there. From 1940 through the 1980s, the quest for coal ravaged millions of Appalachian acres, destroying native forests, productive farmland and leaving behind an ugly, barren landscape. The Surface Mining & Reclamation Act of 1977 required restoration of “vegetation,” but in compliance the land was seeded with non- native grasses and soon invasive species of little commercial or environmental value became dominant. Soil compaction thwart- ed efforts to return the land to pre-mining diversity. Through innovation and cutting- edge science, The Wilds has evolved into a matrix of grasslands, wetlands and hard- wood forests that now serves as a refuge for rare wildlife species, both exotic and native. The private non-profit is literally a living environmental restoration laboratory, one with global impact. 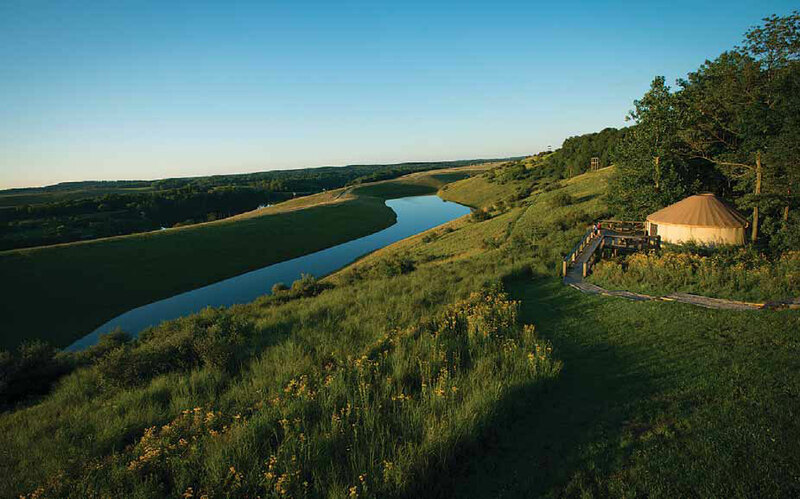 Restoration of the land to pre-min- ing conditions is not possible but The Wilds’ goal has been to make it meaningful now with the mission “…to lead and inspire by connecting people and wildlife.” That’s been accomplished in many unique ways. Whether a day trip, an extended holiday or as a hands-on volunteer, visits to this conservation success story are intimate and inspiring. While not a zoo in the conventional sense, The Wilds is Association of Zoos and Aquariums (AZA)-certified and is affiliated with the Columbus Zoo as well as international organizations dedicated to endangered-species preservation. AZA certification and accreditation assure the highest standards of animal husbandry while also focusing on management for conservation, education, scientific inquiries and guest services. Dr. Ellen Wiedner, director of animal health, says, “Zoos get a bad rap, but if being entertained is what it takes to get people to care, it’s worth it.” Safari tours are indeed entertaining and it’s hard to imagine visitors not being moved by what they will learn along the way. Jack Hanna, who has introduced countless television viewers to wildlife conservation, has been an influential associate at The Wilds since its inception. He has witnessed more than 40 years of transformation and progress and humbly credits the consistent dedication of highly qualified staff. Unlike typical zoos where animals are confined, the 2,000-plus acres of pasture allow herd animals to exhibit natural behaviors and interactions. 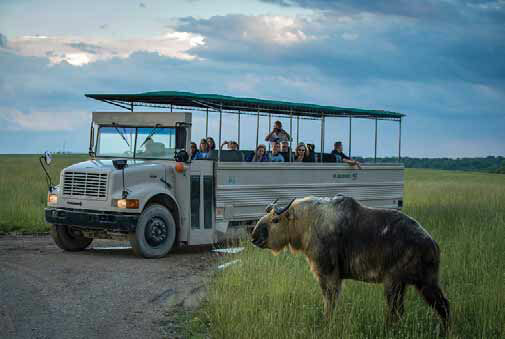 The best way to see them freely roaming the savannah- like terrain is from the open-air safari bus, but a closed, air-conditioned bus is another option. Without window interference, photo opportunities are terrific and it’s not uncommon for animals to come right up to the bus. Carnivores are in large fenced areas for obvious reasons, but walkways provide close observation of the cheetahs, dholes (Asiatic wild dogs) and African painted dogs. As the bus stops in each animal’s range, knowledgeable guides share species-specific histories, current status and The Wilds’ role in their con- servation. 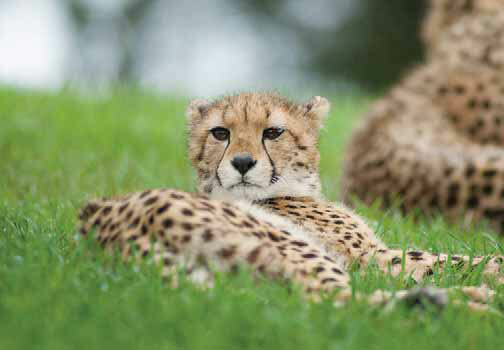 In 2018 Wangari gave birth to two cheetah cubs. 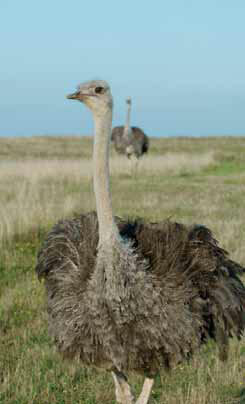 While ostriches can live 40 years, their populations in the wild have been diminishing. 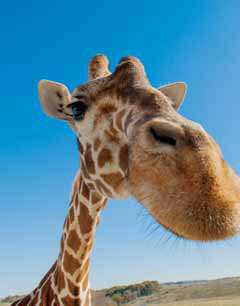 There are 3 subspecies of giraffes at The Wilds. 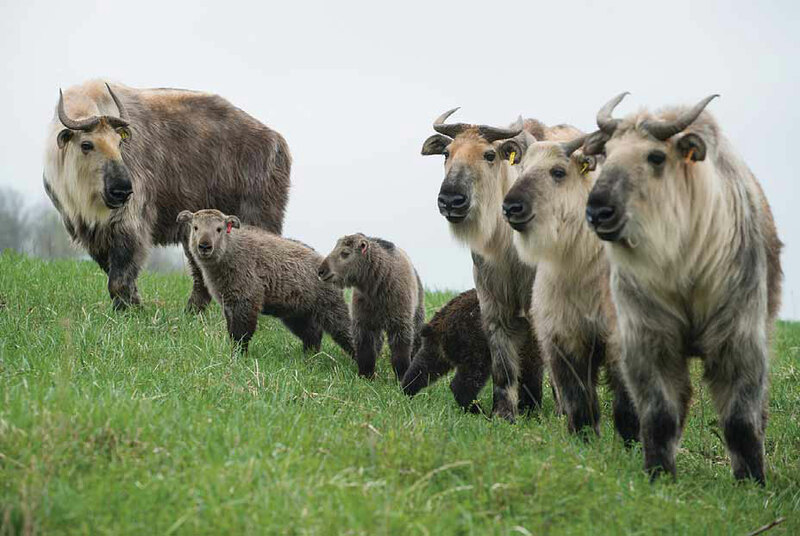 Sichuan Takin originally from China are very rare. A private Wildside Tour takes visitors off the beaten track with a personal guide. 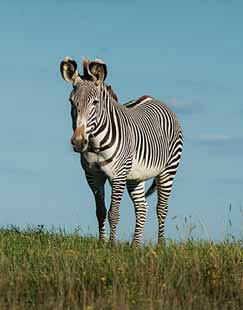 There are fewer than 3,000 Grevy's zebras remaining in the wild. 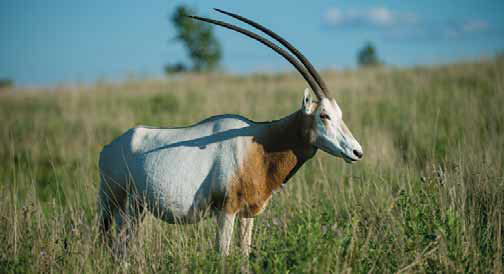 The scimitar oryx is a species of oryx once widespread across North Africa which went extinct in the wild in 2000. 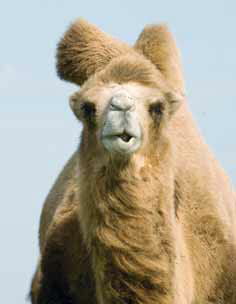 There are fewer than 1,000 Bactrian camels remaining, making it one of the most severely threatened species. An open-air safari bus offers great photo opportunities without window interference. 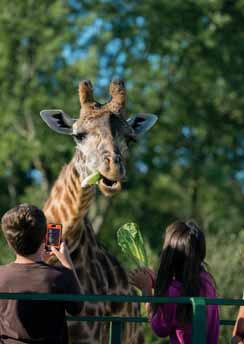 Visitors are entertained by having the opportunity to feed certain animals. The yurts on Nomad Ridge provide luxurious accommodation with savanna-like vistas. 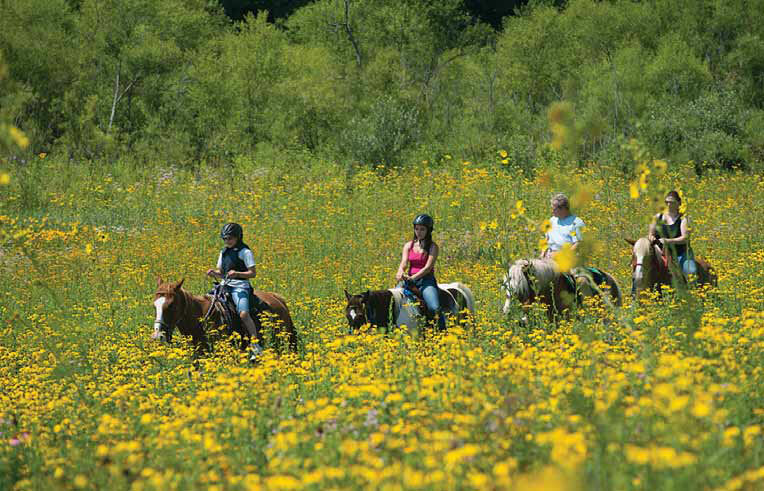 Horseback riders: Yet another way to experience The Wilds. Most are uncommon animals; Sichuan takin, dholes, scimitar-horned oryx and Persian onagers, to name just a few. Unusual creatures such as onagers serve as ambassadors for lesser known species and spark conservation awareness and support. The Wilds hosts more than two dozen rare species. The first introduction in 1992 was Przewalski’s horses, long considered to be the world’s only truly wild horse (that designation has recently been disputed). Native to the steppes of central Asia, they became extinct in Mongolia, with the last wild horses seen there in 1966. All currently existing Przewalski’s horses descend from nine captured in 1945. The Wilds’ captive- breeding program was instrumental in the horses’ successful reintroduction to a Mongolian reserve. Although still listed as endangered, several hundred of the dun-colored equines now live in the wild in China and Mongolia. Dan Beetem, director of animal management, was recently involved in returning the scimitar-horned oryx, extinct in the wild since the late 1980s, to its native African range. Because of The Wilds’ expertise in handling large groups of similar animals, he was engaged to process monitoring collars on oryx at the Ouadi Rime-Ouadi Achim Wildlife Reserve in Chad. While American burying beetles (carnivore scavengers) and Eastern Hellbenders (river-bottom predators) may not be as exotic as takin or rhinoceros, they are also subjects of the North American conservation projects. Each critically endangered species exemplifies the complex role of even the smallest or most obscure creature. When one is lost, others follow. Hellbender populations have been declining for decades due to pollution, development and sedimentation, which threaten the habitat of this elusive 2-foot- long salamander. While Hellbenders can live 50 years, habitat loss is preventing successful natural reproduction. Young salamanders are not surviving. Wildlife ecologist Dr. Steve Spears explains, “If they vanish, there is nothing else like them. They eat anything that fits in their mouth.” His program is giving Hellbenders a helping hand, so to speak, by collecting eggs and raising them to a viable age, then releasing them to remaining healthy natural habitats. Each endangered subject has its own fasci- nating story. 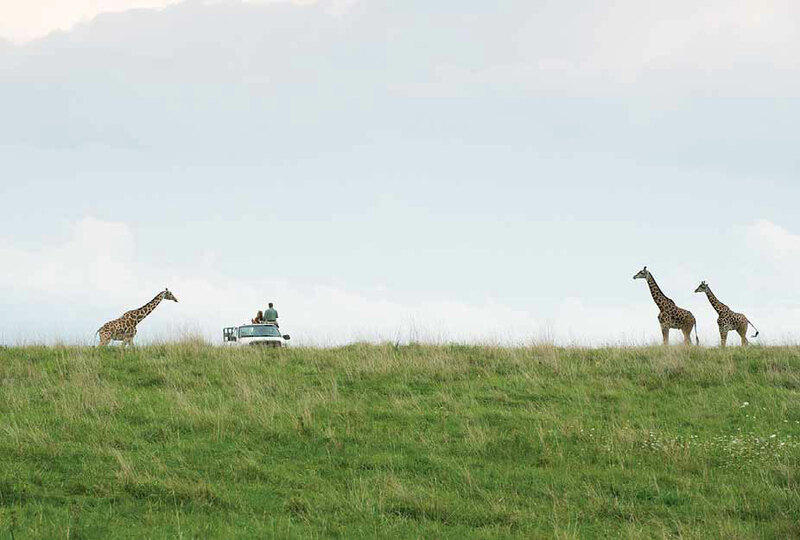 After the safari tour, there’s more to see and do. The 14-square-mile facility includes 150 lakes and ponds for fishing and swimming, miles of hiking and biking trails, pollinator and butterfly gardens, bird- watching stations, several exciting zip lines and even horseback safaris (reservations are required). Accommodations are limited, but everything needed (or forgotten) is readily available. Lodging includes luxurious adults-only yurts on Nomad Ridge, a family-friendly lodge, comfortable cabins at Straker Lake, a restaurant (with gluten-free options), an interpretive center and a gift shop. The Wilds illustrates the con- nectedness of the planet we share. Nothing becomes endangered or extinct by chance. Every decision has a consequence, good or bad. While The Wilds is interesting and fun, it has also inspired serendipitous life-changing acts. Some who first came as visitors or as campers have gone on to pursue conservation-related degrees and careers. A few are now on staff. One visitor who understood the healing power of the natural world was moved to generously fund construction of on-site cabins for veterans’ retreats. Ecological projects illustrating the benefits of native grasses, forest restoration, vernal ponds and other enhancements on post-mined land offer local residents viable ways to mitigate such conditions on their properties. Summer camps stimulate environmental curiosity and enthusiasm and programs engaging at-risk youth present new ways of seeing the world around them. For those so inclined, volunteer opportunities are plentiful for every age group and every interest. But it all begins with a first visit to this unique place. It may feel like Africa, but it’s Cumberland, Ohio. Open daily May-September. Weekends in October. Winter Wild Side tours by reservation November-March. Learn more at: www.thewilds.columbuszoo.org or visit the Facebook page at visitthewilds. When not traveling, Karen Kirsch lives and writes from an old farm in Ohio which she shares with a small furred and feathered menagerie.